Items are showing up as non taxable when I have them set to taxable? Every item I sell is taxable, and all of my items on my upload excel sheet are marked with a Y under the taxable column. 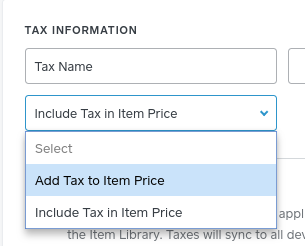 When I edit the item, under the taxes section, the box is checked to tax. So everything looks good to be taxed. However, when ringing up on the ipad, some (only a few) are showing up as non taxable under the item and not adding tax. Why? What am I missing? Re: Items are showing up as non taxable when I have them set to taxable? Hey @mwalsh74, that shouldn't be happening. Have you tried checking the tax settings from your device are set to Add Tax to Price? That will add the tax to the price at checkout. If a tax is set to Include Tax in Item Price the tax won't be added on to the total amount of the charge so it might look like it hasn't calculated a tax - but the tax will be included your reporting. Navigate to the Taxes section of your online Square Dashboard. Click on the name of a tax > on the right-hand side click on the dropdown menu and select Add Tax to Price. From this section of your Dashboard you can also click Apply to Items to make sure a tax is applied to the correct items. Yes, I have made sure it is adding tax to price as well as making sure I have selected all and all items have a check mark next to it to be taxed However, it is still erroring. It isn't even that it isn't calculating it. Under the actual item in the ring up window, it is shaded grey, but it has the words non-taxable under it and then gives the button option to add tax?!?! However, everything is set to be taxed. I am so frustrated by this! I have never had this problem before. That's definitely weird. I recommend giving our Customer Success team a call so they can take a closer look at this. Suggested Thread: Customer Code & Phone Number - Where is it?